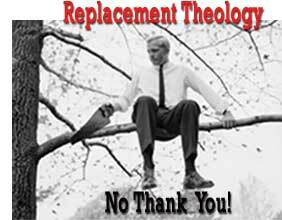 Is it time to re-think the Dispensational charge of Replacement Theology? Dispensationalists assure us that while Jesus offered the kingdom to Israel, due to Israel’s rejection of that offer, the kingdom offer was withdrawn and has now been in “delay mode,” a “holding pattern,” for over 2000 years. But, can this view be sustained? Do we find anywhere in the NT the clear-cut, undeniable teaching of the delay of the kingdom, the deferment of Israel’s hope? The answer to that is unequivocally No! I will focus here on only a few critical verses, of an array that could be adduced. I consider this text to one of the most powerful comments on the issue of Replacement Theology that can be found. Consider the context. Paul addresses the question of whether God had cast off Israel and answers: “God forbid!” (v. 1f). As proof that God had not rejected Israel, Paul gave himself as an example. He was of the tribe of Benjamin, and had accepted Jesus as the Messiah. For Paul, his acceptance by the Lord, Jesus, the Messiah, was proof positive that God was not through with Israel, but rather, that He was being faithful to His promises to Israel! Paul then discusses Israel’s history and how only a remnant had ever been obedient. Israel as a nation had never been “all” obedient, and that was the way it was when he wrote. He then comes to v. 7 and tells us: “Israel has not obtained what it seeks; but the elect have obtained it, and the rest were blinded.” Be sure to get a copy of my seven part series on Romans 11:7. It is an eye-opening study! So, just like it had always been throughout Israel’s history, only a remnant was ever saved, because only a remnant was ever obedient. That it is the way it always had been, and the way it was when he wrote. (Needless to say, this has incredible implications for our understanding of Romans 11:25f, but we cannot discuss that here). But, look closer at what Paul says. ☛ The hope of Israel was the kingdom ruled by Messiah (2 Samuel 7:13f; Ezekiel 37). ☛ The hope of Israel was the resurrection (Isaiah 25:6-10). ☛ The hope of Israel was the Messianic Temple (Ezekiel 37 / Zechariah 6:12f). ☛ The hope of Israel was the New Covenant (Jeremiah 31:29f). ☛ The hope of Israel was the New Creation (Isaiah 65-66). “1.) It symbolized the cosmos / world. 2.) The Temple represented the David Kingdom. “Threats to the temple were threats to the king”- Thus, kingdom and temple are inextricably bound. “It is highly significant for our understanding of Paul, and his re-use of the Temple motif at various key points, that Temple and (Davidic) Messiahship go hand in hand.” (N. T. Wright, Paul and the Faithfulness of God, Parts I & II, (Minneapolis, Fortress, 2013)101). So, when Paul discusses kingdom, he is discussing Temple, When he discusses Temple, he is discussing Covenant. When he speaks of Covenant, he is including resurrection, and when he is discoursing on resurrection, he is including the restoration of Israel in the land! These are such tightly bound symbols of Israel’s eschatological hope that it cannot be over-emphasized. Thus, when Paul says the remnant– the remnant of Israel – was receiving what Israel look for, what Israel hoped for, it is almost impossible to over-emphasize the eschatological importance of that statement. And, this is particularly true in regard to the issue at hand: Replacement Theology. ✔ According to the Dispensational world, Israel is not a partaker of the Gospel of Christ, as part of the hope of Israel. ✔ According to the Dispensational world, the “hope of Israel” was postponed due to Jewish unbelief. ✔ According to the Dispensational world, what was happening with the remnant of Israel when Paul wrote, had nothing to do with the fulfillment of God’s promises to Israel found in Torah. ✔ According to Dispensationalism, Paul was either misguided or lying when he said that his gospel message was from the OT, and that, in fact, he preached nothing but the hope of Israel found in Moses, the law and the prophets (cf. Acts 24:14f; 26:21f). ✔ According to the Dispensational world, the remnant was not, and could not be, obtaining what Israel sought for. The remnant could not be enjoying the fulfillment of God’s promises to save the remnant! The OT promises made to Israel – including the OT promises to and about the remnant! – were not and could not be being fulfilled when Paul wrote. Yet, here was Paul, in Romans, saying unequivocally that the remnant of Israel (the elect) was in fact being saved in fulfillment of the OT promises made to Israel (Romans 9:23-28)! Here was Paul, in Romans 11, saying unequivocally that the remnant of Israel (the elect) was in fact receiving that for which Israel hoped!The Dispensational charge of Replacement Theology falls to the ground in light of Romans 11:7! The hope of Israel was not the church, and was not the gospel – per Dispensationalism. The hope of Israel was the kingdom, the New Covenant, the Messianic Temple, etc. – having nothing to do with the church or the church age in which Paul ministered – per Dispensationalism. But, Paul said the remnant – the remnant of Israel – was receiving the hope of Israel when he wrote. Therefore, the OT hope of Israel, the kingdom, the New Covenant, the Messianic Temple, etc. were being fulfilled when Paul wrote! This means that Israel’s hope had not been postponed. It means that the hope of Israel truly was the body of Christ and the Gospel of Christ. It proves that, as we have shown, Old Covenant Israel’s physical things anticipated and foreshadowed the spiritual things of Christ. It proves that the Dispensational doctrine that one day the church will be replaced with Israel is false. The “reverse Replacement Theology” of Dispensationalism is an offence to the Gospel of Christ.